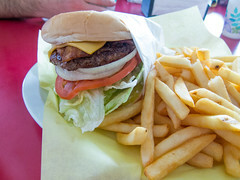 I’ll have to say, there’s something I rather like about the particular style that California burgers have. It’s a bit of a particular style: a fairly thin and well-crisped burger patty, served up with generous layers of lettuce, onion, and tomato (I’ve been told that this is a throwback to the days when fresh tomatoes and lettuce weren’t a standard item in grocery stores), usually on a toasted bun. And, somewhat peculiar to the style (see my reviews of Nessy Burgers for a good overview), the burgers are usually built upside down, with the condiment on the bottom, below the patty. But hey, it basically works, and there’s part of me that always enjoys a good, straight-forward California-style burger. So when my day job has had me traveling to San Leandro, CA (a bedroom community just south of Oakland), I couldn’t resist coaxing my coworker Marc into a stop at Giant Burger. First of all, the place isn’t really called “Giant Burger”, but “1/3 Lb Original Giant Burger”, since, like “Ray’s Pizza”, “Giant Burger” isn’t terribly unique. 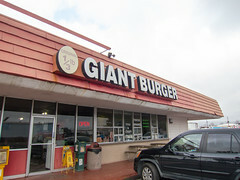 In just the Bay Area alone, there are a half-dozen unrelated “Giant Burgers”, with variations of the name usually involving a weight or the word “original”. So in this case, it’s really “1/3 Lb Original Giant Burger”, just so I won’t confuse it with, say, “1/4 Lb Giant Burger” over in Hayward, or “Nation’s Giant Burger” with locations all over California. Still, it’s a classic-looking burger joint that’s obviously been serving up burgers for a long time (as well as an eclectic menu including breakfast and teriyaki plates). Indeed, reading over the menu, while there are some rather nice looking teriyaki plates, and a decent looking selection of large cold sandwiches and steak sandwiches, a good half of the menu is dedicated to one basic item: the 1/3 Lb giant burger with various combinations of toppings. So I went the 1/3 Lb giant burger with bacon and cheese, with a side of fries. And how was it? Well, it was everything I expect about a good California burger: a nice, juicy, crispy patty, some crunchy lettuce and onions, a good thick slab of onion, and some melted cheese and mayo. Add in two thick slices of bacon, and this was a very pleasing burger. Some decent fries, and this was a nice lunch. That said, if I go back, several of the other diners had some rather nice looking teriyaki plates.